Dotson was sensational in his first year at Oregon. Photo courtesy of USA Today Sports. The Armed Forces Classic, a preseason college basketball contest that pits two high-profile teams against one another, had its inaugural game last year on the Ramstein Air Base in Germany. Featuring unranked Connecticut and No. 14 Michigan State, the Huskies pulled off an early upset by downing the Spartans 66-62. This coming year, in the second annual Armed Forces Classic, the Oregon Ducks have been announced as one of the two participants in the game, with the Georgetown Hoyas being the other. Set to take place on Friday, November 8, the game will be one of the main highlights of ESPN’s Veteran’s Week that seeks to honor those who have served and are currently serving in the United States military. Though the location for the game has yet to be determined, the game will undoubtedly be a key matchup early on that will showcase the strengths and weaknesses of both teams. Georgetown (25-7 overall, 14-4 Big East) finished their 2012-2013 regular season with a bang, winning a share of the BIG EAST regular-season title after being unranked in the preseason. Sharing the title with eventual National Champion Louisville (35-5 overall, 14-4 Big East) and Marquette (26-9 overall, 14-4 Big East), the Hoyas entered the 2013 NCAA Men’s Basketball Tournament as a No. 2 seed but were bounced 68-78 by upstart Flordia Gulf Coast in the second round. They finished the season ranked 17th in the USA Today Coaches Poll, Georgetown will look to be a strong team in 2013-2014 while contending for another Big East title. Losing Big East Player of the Year Otto Porter Jr. to the NBA, the Hoyas return all other players except for Brandon Bolden, who ended up transferring to Kansas State. Greg Whittington, who averaged 12.1 points and 7.0 rebounds per game before being academically ineligible for the final 19 games, will return to the roster and give their team a needed boost. Georgetown will also add a face the Ducks are familiar too, as former-UCLA player Josh Smith may be eligible to play for them in 2013-2014, though it is unclear as to when he will actually be available. Oregon, meanwhile, is coming off a season that saw Dana Altman continue to improve the program, with the Ducks nearly taking the Pac-12 regular season title while claiming the Pac-12 Tournament Championship. 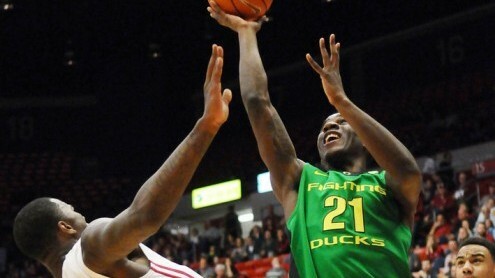 Boasting a 28-9 record overall and 12-6 record in the Pac-12, Oregon saw themselves as a No. 12 seed in the NCAA Men’s Basketball Tournament before upsetting both five-seed Oklahoma State and four-seed St. Louis. Their outstanding run would end, however, with a loss to Louisville in the Sweet 16. While they did lose significant contributors in E.J. Singler, Arsalan Kazemi, Carlos Emory and Tony Woods, the Ducks do have a stable of young talent that should help them once again contend in 2013-2014. They finished the season at No. 15 in the polls after being unranked in the preseason. As mentioned previously, this year’s Armed Forces Classic will be its second annual, with five total scheduled to take place. The games are to be played on US military throughout the world and will have one game take place at each branch of service. For more information on the classic, you can go to www.armedforcesclassic.com.